Al Ain: A double from Yuya Osako helped Japan to seal a convincing 3-0 win against Iran, in the high stakes first semi-final of the 2019 AFC Asian Cup on Monday. Currently holding a Fifa ranking of No. 50, and making their ninth appearance in the tournament, Japan had been far from convincing throughout the last five matches, while sneaking through with the narrowest of margins. On Monday, at the Hazza Bin Zayed Stadium, they were a different side — going by their dominance in possession and execution with a couple of key moments proving to make the difference. The defeat prompted veteran Iran coach Carlos Queiroz to quit after nearly eight years in charge. After a goalless first half, Japan cashed in on a minor lapse in concentration from the Iranian defence in the 56th minute as Osako rose to head in a Takumi Minamino cross. A Video Assistant Referee (VAR) review then led to a penalty, which was coolly dispatched by the striker from German side Werder Bremen for his second goal of the night. Genki Haraguchi then drove down the heart of the Iranian defence and put the issue beyond doubt with a stiff left-footer. Japan, for whom this is the fifth entry into the final, await the winners of Tuesday’s second semi-final between hosts UAE and Qatar. On Monday, both teams started off on a contrasting note with Iran using the flanks with the long ball, only to find the Japanese defence led by skipper Maya Yoshida adept in dealing with everything thrown at them and countering with quick forward passing. 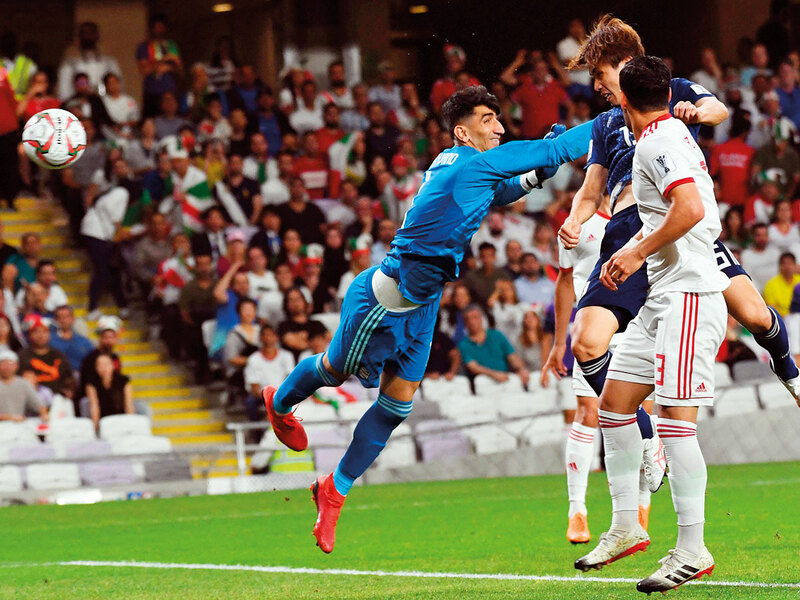 The honours were even in the first 45 minutes with Japan escaping a scare in the third minute itself as Sardar Azmoun went for a through ball from his captain Seyed Ashkan Dejagah, but Japanese goalkeeper Gonda Shuichi came up with a timely intervention. Japan came back in the 13th minute when Yuto Nagatomo made a run on the left and sent in a delivery but Takumi Minamino’s slide was weak and wayward from the Iranian goal. Six minutes later, the Samurai Blue once again came up with a finely worked out move, but Ritsu Doan’s scampered try went past the Iranian goal. Iran’s best opportunity came in the 22nd minute following a wrong pass from Shuichi Gonda, only to see the Japanese goalkeeper made suitable amends stretching his left foot to keep out a certain goal from Sardar Azmoun. It was Japan who took the lead much against the run of play. They appealed for a foul as Minamino went down outside the area, and even as the Iranians spoke with Australian referee Christopher Beath, the Japanese midfielder who plays for FC Red Bull Salzburg in Austria ran down the flank, controlled and sent in a dainty chip for an unmarked Osako to head home. The second goal was a mistake in the 63rd minute from Morteza Pouraliganji, who handled inside the area as he went in for a tackle and referee pointed to the spot. However, Beath went in for a VAR review and once again it was the collected Osako sending his kick to the left of goalkeeper Ali Reza Safarbeiranvand to make it 2-0. The Japanese put the match beyond reach of the desperate Iranians as Haraguchi quickly took the Iranian defence by surprise with a clever body feint to ram home the third with two minutes gone into injury period. With three of the current squad part of the victorious 2011 team, Japan have won the trophy a record four times — in 1992, 2000, 2004 and 2011 — thus becoming one of the most successful teams. With Monday’s win, Hajime Moriyasu will be now eyeing the rare record of becoming the first person to win the AFC Asian Cup as both a player and as head coach. The former Japanese national team midfielder, who had 35 caps, was a member of the squad that won the AFC Asian Cup in 1992. During that tournament, Iran and Japan had faced off in the group stage in Hiroshima and Kazuyoshi Miura had scored the only goal in their 1-0 win against Team Melli.